The blood-stained wrist watch says its 9:44 am. Its second hand is still flashing but in a very normal pace. 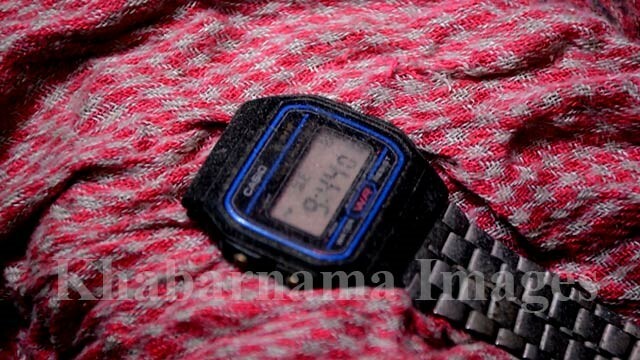 The owner of this watch may have been sleeping under heaps of dust for many years, and his friends were inclined to see his pulse beats instead of the watch’s second hand. Next to this watch, there are scraps of cloth, from a glance of which one can smell the blood. 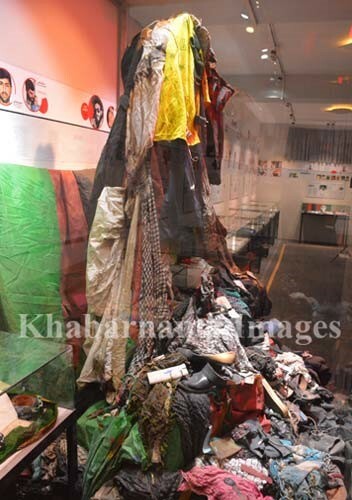 This is a collection that contains the remaining objects of war victims; victims that have died in recent years as a result of suicide and explosive incidents. The remnants of this collection have been dedicated to the victims of the past four years, but like this collection, there are dozens of other boxes, that contain memories of victims of the 14-year period of the Afghan Republic (1978 – 1992) so far who have lost their lives in various conflicts of Afghanistan. 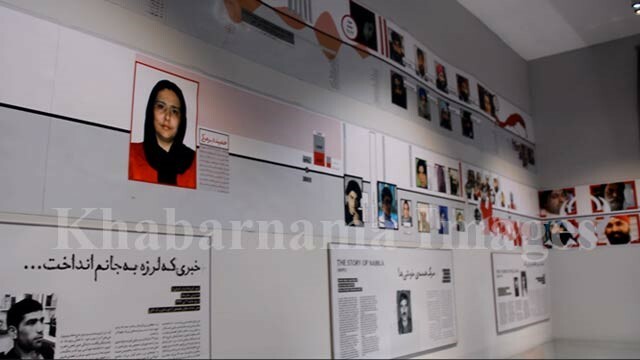 Afghanistan Center for Memoirs and Dialogue has collected and archived the memories of these victims in three parts. The first part is the 14-year period of the Afghan Republic (1978- 1992), the second part is the ten-year Taliban and Mujahideen period (1992-2001) and the third part is for current period of Afghanistan (2002 onward). Each period includes a list of civilian causalities of war, photographs and memories boxes and objects they left behind. The preparation, design and set up of information for each period has been carried out with the efforts of the center staff and the cooperation of the victims’ families and a number of active organizations in the human rights and transitional justice sector. The center is established at a time when forty years of war and violence in Afghanistan has passed. These four decades of war have caused the killings of millions of people, and destruction and plunder of several cities. That is not all, this period also displaced millions of citizens. 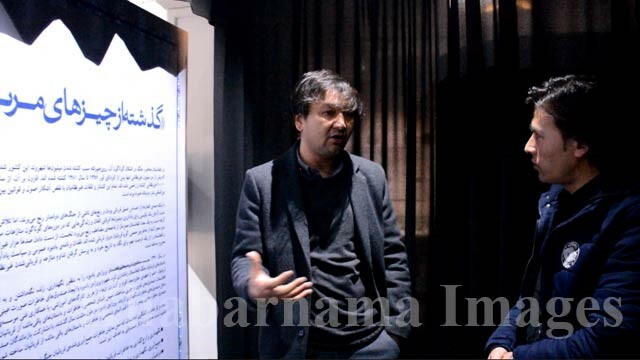 The founders of the Afghanistan Center for Memories and Dialogue say that the center serves as a reminder and respect for victims of war who suffered periods of violence and devastation in Afghanistan. They emphasize on justice and investigation of war crimes and human rights in Afghanistan. The United Nations Assistance Mission in Afghanistan, appreciated the efforts of Afghanistan Center for Memory and Dialogue and said that it has done a great job in the area of ​​transitional justice and respect for human dignity. Richard Bennett, head of the United Nations Assistance Mission in Afghanistan’s Human Rights Department at the opening of the center said that, the center of memory and dialogue serves to look at the future, not at retaliation or revenge. He says the United Nations believes that the peace process should be justice based. 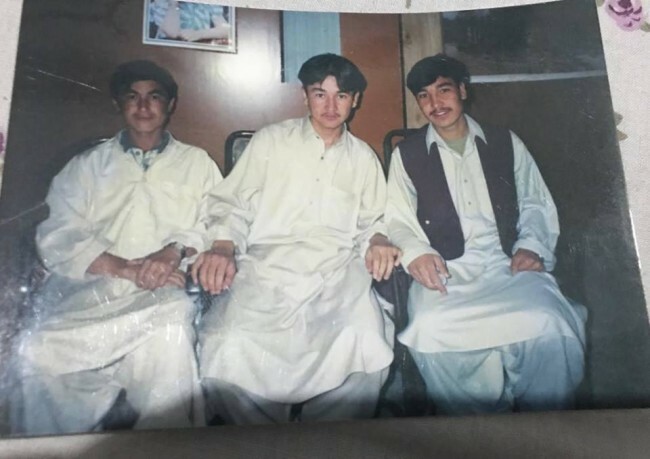 The Center for Memory and Dialogue of Afghanistan is part of the work of the Afghan Human Rights and Democracy Organization which is headed by a young Afghan “Hadi Marefat” who is just 39 years old. A year before the withdrawal of the then-Soviet Union from Afghanistan and the era of Dr. Najibullah’s, several members of Hadi’s family fell victims to the wars in Afghanistan. This caused the family of four to travel to the neighboring country of Pakistan. But there, life wasn’t easy either, due to the lack of employment opportunities for his parents. Hadi was an eight-year-old at the time and he along with his sister, had no option but to do manual labor work. Hadi firstly carried out a clean-up work at a telephone station, and then, along with his sister, learned carpet weaving through which he made ends meet for their home and school expenses. Later on, when he joined school and language center, he worked hard to acquire skills which reflect a better time in his life. His commitment and hard work paid off and he got the opportunity to teach English in other educational centers. The war in Afghanistan made Hadi not only lose his dear ones but as a migrant, he experienced the hardest days of life. Tragically, he also lost his sister in Pakistan to an illness. Hadi as an Afghan migrant grew up amidst the challenges in Pakistan, and returned to his country after 17 years there; at very point in time when the Taliban regime had collapsed, and the hope of a better future began to linger, holding the promise of a new era that would open up the doors of schools for boys and girls. His dedicated approach to his education led him to choose teaching and he subsequently started his career as a teacher in Marefat school. Hadi was 25 years old when he made the journey back home, equipped with English language skills. 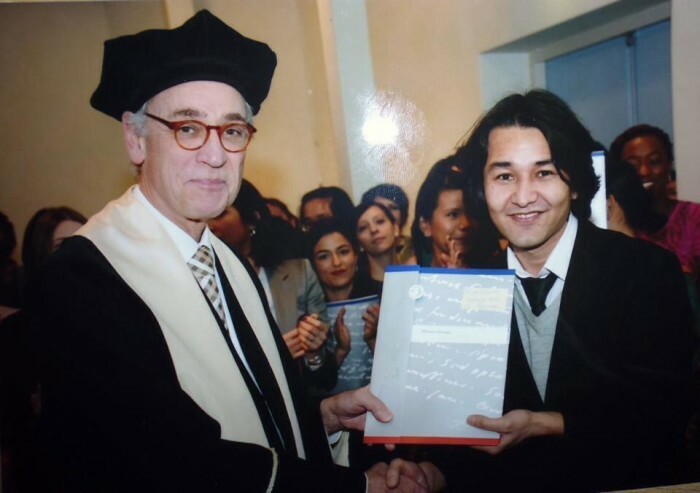 The coming of Americans and establishment of International organizations in Afghanistan provided work opportunities for young people like Hadi who were proficient in English skills. After teaching in Marefat school, Hadi worked as a human rights defender with various national and international organizations, including Save the Children, the Joint Electoral Management Office, United Nation’s Human Rights Department, the Human Rights Watch and Center for Civilians in Warfare. Along with his work with various organizations, Hadi also pursued his higher education. He earned his undergraduate degree in Political Science and International Relations from the University of London’s School of Economics and Political Science. During undergraduate studies his focus lied on human rights and conflict. Mr. Marefat studied human rights and conflict at the International Institute for Social Studies of Erasmus university of Netherlands. During his undergraduate studies, he worked with Human Rights Watch from 2009 to 2011. In the meanwhile, in 2009 he also established Afghanistan’s Human Rights and Democracy organization in Kabul. In London, Hadi met with well-known sociologists like Anthony Giddens, the then head of the university, and also with Fareed Halliday, David Hilde, in whose company his outlook of the world broadened and found a new prospective. Afterwards, along with his post-graduate studies he started working with an international organization called Center for Civilians in Conflict. In this period his work was focused more on the civilian sector which led him to closely work with the Afghan government, especially with the National Security Council and the Ministry of Defense in the area of ​​civilian casualty reduction policy development. Since the establishment of Human Rights and Democracy Organization of Afghanistan, Mr. Marefat has organized more than 100 human rights programs in Afghanistan. According to him, so far, more than 300,000 people have benefited from the programs of the organization. This is the first organization from Afghanistan which has the membership of international coalition for protection of cultural heritage. It is one of the best international coalitions which has more than 200 prestigious international museums’ membership. The United States Holocaust Memorial Museum, Kigali Genocide Memorial, Interrogation and Detection Museum, Toul Sleng Genocide Museum and other world-renowned museums from Latin America to Europe and the Middle East, have the membership of the coalition. In 2005, the Afghan Independent Human Rights Commission launched a national survey called “People’s Voice for Justice”. The study led the Government of Afghanistan to make an action plan for the Transitional Justice and Reconciliation Program. The program was initiated by the government for four years, from 2006 to 2009 in Afghanistan. According to Mr. Marefat, despite the fact that hundreds of millions of dollars were spent on this program, there is no tangible result. On the other hand, in 2007, the Afghan parliament passed an amnesty law which, according to Marefat, created another major challenge to transitional justice. Though at first transitional justice was one of the major plans of the international community in Afghanistan, but with the escalation of insecurity, the world’s main focus lied on peace and stability, and the issue of transitional justice was forgotten. Hadi Marefat says that all of this has inspired them to establish an organization that works closely with victims of the conflict in the area of ​​transitional justice. According to him, the organization for Human Rights and Democracy of Afghanistan has been able to do some effective work in these areas. One of the activities of this organization is the establishment of the Center for Afghanistan Memories and Dialogue, which has placed efforts to collect the memories and narratives of the victims in the framework of this center. For eight years, they have been working on collecting photographs and remaining items of war victims. Along with it, the organization has collected 35,000 signatures from all over Afghanistan for naming a road in the memory of war victims, and it is the first organization that named a road in memory of a victim. With the approval of the Afghan government, they named the Pul-e-Charkhi Road of Kabul, in name of the Victims of War”. Besides, since 2011, the organization has been founded councils for war victims in various provinces of Afghanistan, which are currently being established in most provinces. In addition to transitional justice, the organization has been one of the most influential bodies in the women’s rights field. Through conducting a research called “Women of Afghanistan after Taliban Era; Does History Repeat Itself” in which more than 5000 women were interviewed from across Afghanistan the organization has been able to reveal hidden sides of women’s life in Afghanistan. Mr. Marefat says that “most of Afghanistan’s laws were crime inducing, meaning that, some of the articles of law gave jurisdiction to an irresponsible person which itself causes crime in the society, and in the present at least there is no such article in criminal law of Afghanistan. The Afghanistan Human Rights and Democracy Organization, along with other human rights and democracy activities in Afghanistan, has also been working on reducing conflict at community levels. The organization launched a program called “From I to We and We to Society.” In this program, from each province of Afghanistan, six people, including boys and girls are chosen to travel to six other boys’ and girls’ homes in different provinces. Mr. Marefat says that the program plays a role in lessening of conflict at local levels in Afghanistan. “The program mainly focuses on the stereotypes and assumptions that the various tribes of Afghanistan have from one another,” he added. When they see each other closely, some of their judgments and assumptions change. Little by little they understand each other and in fact, from a moralistic prospective, mutual acceptance deepens. For accomplishing its goals, the organization uses artistic means. For instance, this organization has documented several plays in the end of war in Afghanistan and conflict reduction. One of these plays is named “Alef, Khay 57-87”, which has been featured in more than 16 provinces of Afghanistan. The letter “alef” – first alphabet in Dari, the main language of Afghanistan – means the beginning and the letter “khay” means the end. The producers of this documentary wanted the war that started in 1978 to end in 2008. Another documentary is a theatrical one called Beneyahat Tamam (Infinite All) produced by this organization. This documentary is also featured in the provinces of Afghanistan, as well as in the United States and European countries. The names of sons and daughter of Mr. Hadi Marefat are “Milad Bek, Beta Begom, and Farzad Bek. And his wife is a sport coach at a sports club in Kabul. Marefat considers his mother as the hero of his life, who supported him in the difficulties. Marefat talks about his future plans and is inspired to hold a dialogue between Afghan women and clergies which will be something unprecedented. He plans to do it in the new solar year. The creation of a “national tribal dispute resolution policy in Afghanistan” is another plan of Mr. Marefat in the new solar year. To do this, they plan to hold five major “referendums” in Kabul and five in other provinces of Afghanistan, including Kandahar, Nangarhar, Herat, Bamyan and Balkh. In his 14-year human rights journey, Mr. Marefat has made a significant contribution to Afghanistan’s human rights and democracy works. “The journey continues,” he says.